Protecting your hearing is important, so is understanding the functioning of your ears to take measures against noise. To understand this, letâ€™s divide this in three parts. That is outer ear, middle ear and inner ear. A video below may also help in understanding the working of your ears. This is the outer (visible) part of the ear known as Pinna. 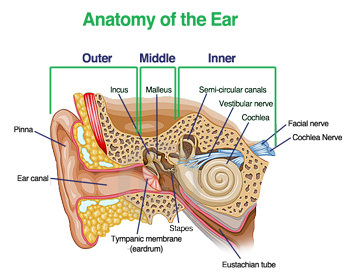 The sound enters at the Pinna which filters the sound waves and sends it to Tympanic Membrane also known as eardrum. Both, Pinna and Tympanic membrane combine is known as â€œOuter Earâ€�. The filtered sound waves reach the Tympanic membrane and cause it to vibrate like a drum when its beaten, hence the name â€œEardrumâ€�. Behind the eardrum is a pocket of air that resides three tiny bones called, Malleus, Incus and Stapes. The vibrating beat in the eardrum causes the vibration in these three bones leading to an organ called â€œcochleaâ€� in the inner ear. These three bones connect the outer year with the inner year. The cochlea and the semi-circular canal are responsible for two functions, one being the sense of balance and the other is the hearing, also known as cochlea semi-circular canal function and the cochlear nerve (auditory nerve) function. The cochlea and the canal together form the Inner Ear. The sound vibrations that pass to the Inner Ear via the vibrations of the Middle Ear bones are then passed through cochlear nerve to be processed in our brains.